In the past, focusing on a few keywords could help increase the likelihood of having the top spot on the search engine results page (SERP). When prospects searched online for your business, if that search engine’s algorithm concluded that your website was the most relevant, then the site received a high ranking. A short-tailed keyword is generally 1-3 words long. Since this broad term is used most frequently, it has a large search volume. People that use these keywords are generally at the beginning of the buyer’s journey and/or trying to educate themselves about a subject. A long-tailed keyword is 4 or more words long. These more more descriptive terms have a lower search volume. This person is usually farther in the buyer’s journey and has a more specific goal in mind. Users searching with short-tailed keywords are generally interested in the subject and do not have the intent of buying or converting. Choosing to rank for short-tailed keywords isn’t as helpful for sales and can be costly. Since more people enter short-tailed keywords into search engines, these tend to cost more during keyword bidding. Companies want to have lots of impressions on search engine results pages, so there’s higher competition for the top ranking with short-tailed keywords like “shoes”. Alternatively, someone using a long-tailed keyword has a higher likelihood of converting to become a buyer. This user has thought more about what to search. They chose the best wording, which brought them closer to the desired outcome. In fact, 64% of people are adjusting how they search by using longer, more conversational queries to help them find specific answers. Another aspect to consider is domain authority or SEO ranking. Search engine algorithms will award high ranking to sites that use more long-tailed keywords. Artificial intelligence within these search engine algorithms better understand human language progression. Search engines can now understand queries as entire thoughts. The person in the example above does not need to search “restaurants” and filter through billions of results that may be irrelevant. Instead, search engines can now understand searching “best Italian restaurants near me” and can tailor her results based on the sites that chose to rank for the terms above or other synonyms. Results on the SERP are also influenced by the enabled location on her phone. But appropriate keyword use is no longer enough to grab that top spot on the SERP. Now search engine algorithms issue higher rankings to sites that are formatted using pillar pages. Pillar pages are also known as topic clusters, evergreen pages, deep resources pages, etc. They cover a topic in depth by delivering quality content related to one subject. Linking to the pillar page are clusters of subtopics that take a deep dive on a specific detail that is pertinent to the overall topic. 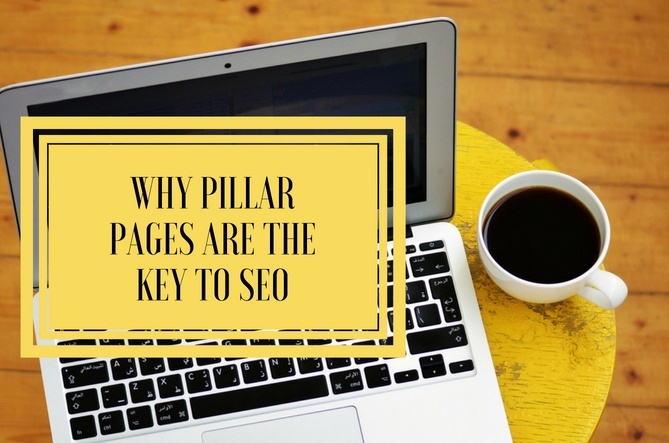 A pillar page should be constructed around the desired broad topic term. Within this broad term, there are supporting long-tailed keywords for the clusters of subtopics. Choose your long-tailed keywords based on the searches where you want your site to appear. The page should address the challenges and concerns your buyer personas face on a regular basis. Identify a head term. The head term is a broad search topic that you want to be known for, using language your audience would use to search, and must be general enough to have many subtopics and a high search volume. (A minimum of 2,400 searches a month is recommended.) Consider this term and its synonyms carefully. The search engine algorithm evaluates all the webpages that want to rank for this term and gives top ranking to the best search-optimized page. Eventually, the pillar page should be able to address anything about the head term topic that a person may search, while making more details available in the cluster of supporting subtopic pages. In my example above, “inclusive language” is the head term for the pillar page. Brainstorm subtopics. A subtopic doesn't have to contain words from the head term, but it does need to create increased value for the user in 3-5 words. Be sure that the subject can be dwelled on and linked back to the pillar page. Again, subtopics must be searchable terms that contain the language that your target audience would use. In my example above, “gender inclusive language” is one of the subtopics introduced on this pillar page with more detailed info on subtopic pages. Continue when there are gaps in information and add those subtopics to your content editorial calendar. Include links from each subtopic back to your pillar page so search engine algorithms recognize the connection and can give your site a higher SEO ranking. Ultimately, your pillar page should be what is referred to as a 10x content page that is comprehensive and 10 times better than what is out there in your industry. Your goal is to demonstrate your expertise and make the reader want to download your useful information. Remember that a website and its content should be written with a strong focus on the user’s experience (UX), not solely on appeasing a search engine algorithm. A website should flow naturally and remind users of its purpose and its call to action. As a mission-driven business, quality and credibility are the most important factors for your site. Creating content pillars is simply one more tool to advance your mission. Sabrina Hood is a senior at the University of Vermont where she is studying marketing and French. Originally from New Jersey, she hopes to pursue a career in marketing.